No Respect For The Women On The Sidelines In TV, football sideline reporters are often women. But commentator Frank Deford wonders why they aren't up in the booth, calling the game. 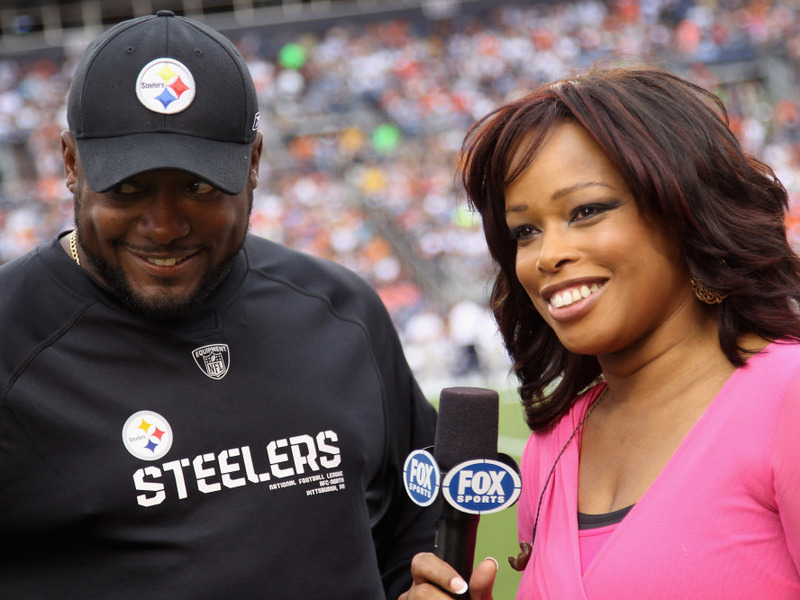 Pam Oliver, sideline reporter for Fox Sports, interviews head coach Mike Tomlin of the Pittsburgh Steelers as he leads his team against the Denver Broncos. Football season has hardly started and fans are already grousing about sideline reporters. To be sure, sideliners now exist in most all sports, and a handful of them –– notably Craig Sager of Turner, who was apparently in town the day the clown died, and thus got all his clothes –– are downright famous. While Sager is best known for basketball, it is football sideline reporters who are most identified with the sport. That is because, just as football offensive linemen are supposed to be fat, football sideline reporters are supposed to be women –– attractive women. Who can ever forget a drunken Joe Namath mumbling to one of the poor sideliners that he wanted to kiss her? But, evidently, it is the television version of the laws of the Medes and the Persians that football sideline reporters must be female. There's even a website: sidelinehotties.com. Presumably, TV believes that a touch of pulchritude at the mic improves ratings –– affirmative attraction action. And so the sideliners are delegated to freeze down on the tundra while the male play-by-play announcer and his hefty old gridiron warrior expert babble on comfortably up in the heated booth. The sideline reporter is sort of like the scroll at the bottom of the screen, which, especially on ESPN, rolls on endlessly, even when it doesn't have anything of consequence to say. Likewise, the sideliner. If you've got the technology for a scroll or a live body on the field, use it. The most asinine task sideliners are required to carry out is to ask coaches, before the second half, what plans they have for the rest of the game. The coach who's ahead says he wants to keep up the intensity and avoid turnovers. The coach who's behind says he wants to get more physical and avoid turnovers. Back to the booth. And all the guys watching with their buddies laugh at the ditzy babes who ask such obvious stupid questions. But the irony is that most sideline reporters –– whatever sport, whichever gender –– really have done their homework and really do know their stuff. Most of them are terribly overqualified for the assignment of being a human scroll. But, of course, whereas it has not been uncommon for years for newspapers to have women on the football beat, television wouldn't dare allow a female up into the booth to actually call the game. The funny thing is –– as I was reminded when I heard Mary Carillo doing tennis commentary during the U.S. Open –– is that when you hear a female voice in tandem with a male voice, the contrast sets off both advantageously –– as TV stations always pair male and female anchors on the local news. But in sports television, sideline reporters can only go side to side, never up. Their place is down on the field, with the cheerleaders.